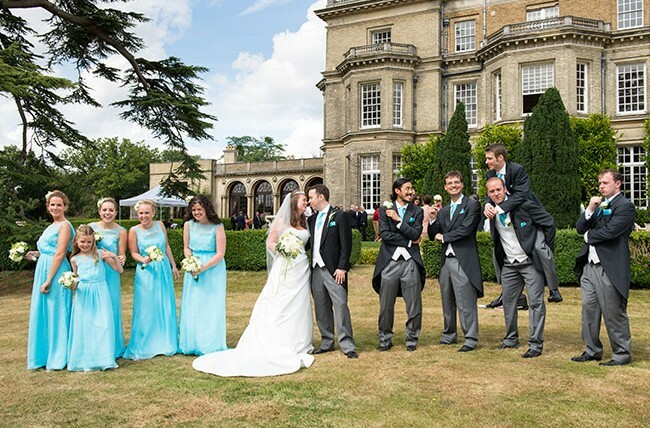 We thought we would take a look back over weddings from the last couple of years and wanted to share the brightest wedding we had the pleasure of being part of. 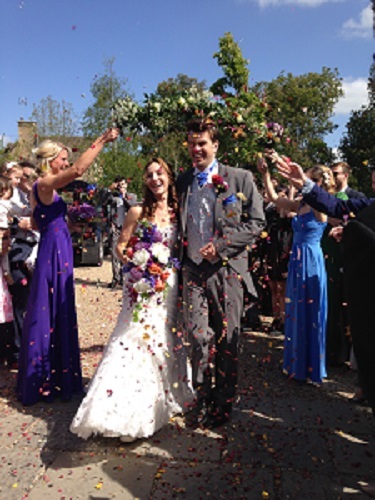 James and Emma – it was truly inspirational. 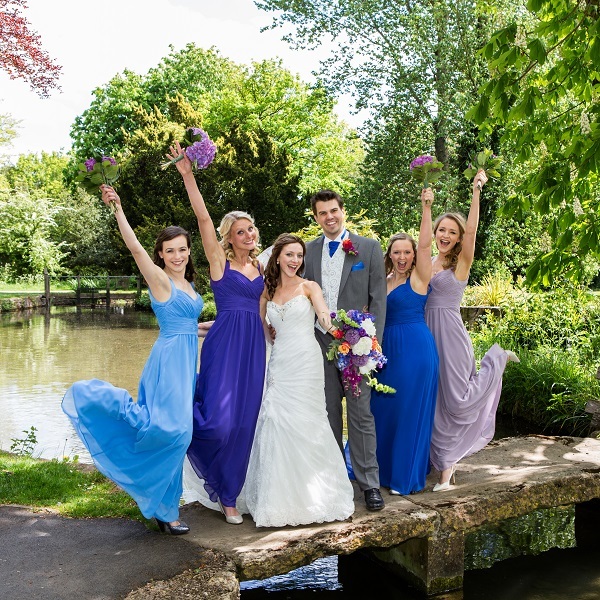 Hopefully you can draw some fabulous tips and ideas for your own wedding! I met Emma when she was working for The King’s Chapel in Amersham and she remembered me for her own wedding when she moved to the Cotswolds. 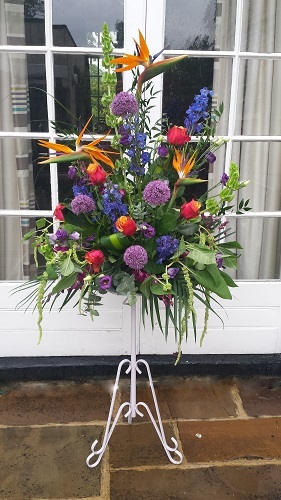 Emma’s bouquet was one of the most vibrant and bright that we’ve made, but we loved it. 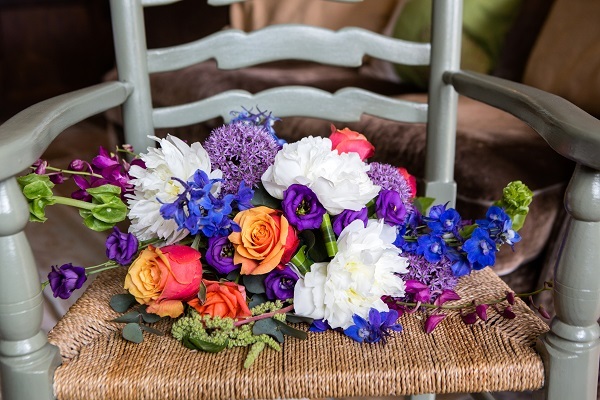 I’m sure that this flower mix is completely unique to Emma, which is what your wedding should be all about! For impact and an inexpensive bouquet, you can’t beat the hydrangea. They’re also available year round too – win, win! In the early months, however, we have to source them from South America. The colours are also more limited at that time so we recommend using them in the summer months where possible. This is when you get the best choice of colours and when they are more robust. 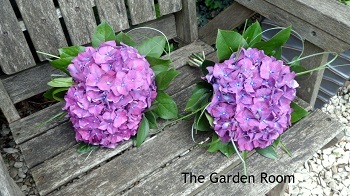 For Emma, the hydrangea was a natural choice as it perfectly fitted her tropical, vibrant colour scheme. Why stay with just ivory for the buttonholes? Be bold, like Emma, and choose ties and waistcoats to match. 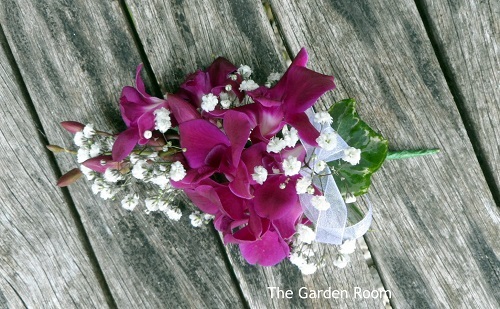 We always add a little something from the brides bouquet to the groom’s buttonhole for a pulled-together look. This lady’s corsage used dendrobium orchids. These spectacular flowers come in many colours and can also be made as a wrist corsage or can be attached to a handbag with a simple magnet. Emma’s other wish was to do the reception flowers herself. 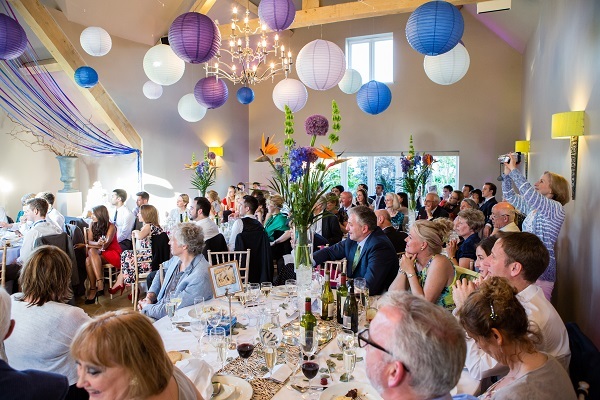 James, her fiancee, was very keen to stylise the room with fishing nets, foliage and hanging flowers. They didn’t quite go that far in the end but they added their own personal touches using lots of colour. We loved the lanterns and streamers! 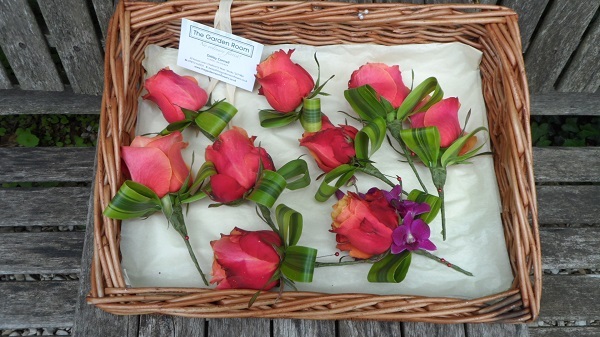 Emma and her friends also copied the hand tied vase arrangement that we had done – florists in the making, all of them!